IFP has taken a look at the front pages of newspapers on Wednesday and picked headlines from 20 of them. IFP has simply translated the headlines and does not vouch for their accuracy. 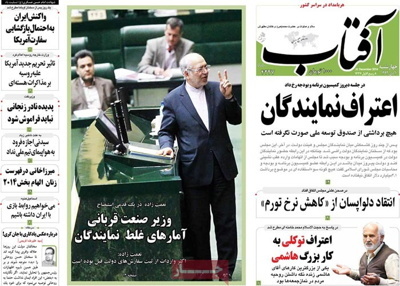 Many Iranian dailies on Wednesday led on the comments of Foreign Minister Mohammad Javad Zarif in parliament that Iran seeks all sanctions to be lifted at the same time. 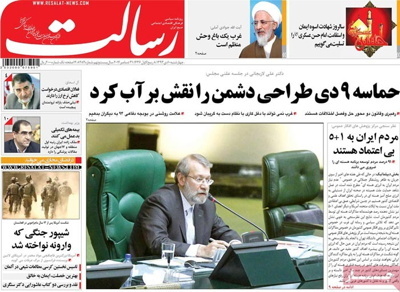 The second yellow card of the Islamic Consultative Assembly to the minister of trade over imports of rice and luxury cars and an end to a row between parliament and the executive over alleged withdrawal by the latter of money from the National Development Fund also dominated the front pages of Iranian newspapers. Afarinesh: “Political maturity in the country requires commitment to a model to settle differences,” said the Iranian parliament speaker. 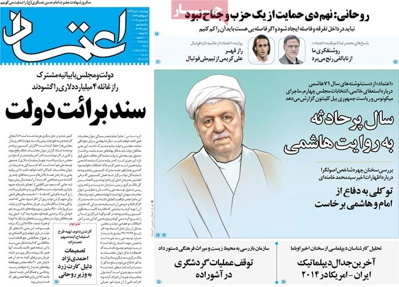 Aftab-e Yazd: The minister of mines, industries and trade is on the verge of being impeached by the Islamic Consultative Assembly. Wrong figures presented by some MPs are to blame. 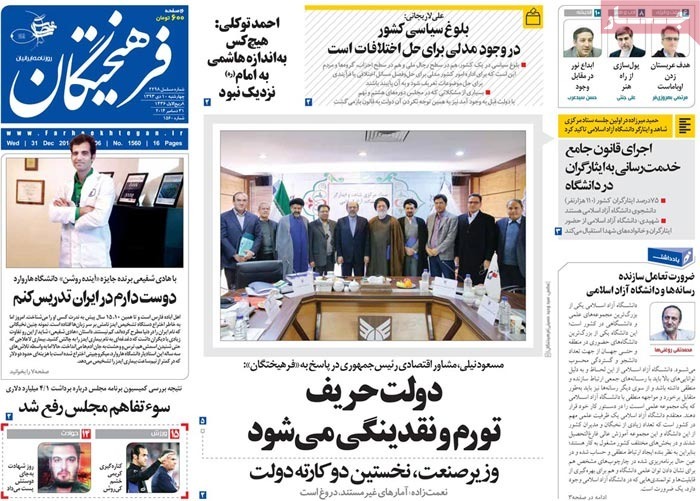 Aftab-e Yazd: At a meeting of parliament’s Planning and Budget Committee, MPs admitted that there has been no withdrawal by the government from the National Development Fund. 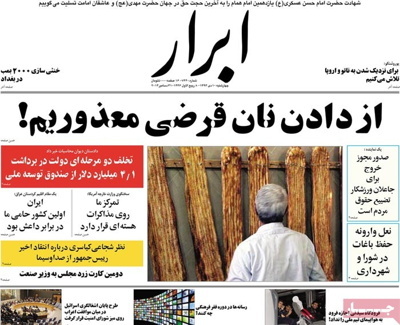 Arman-e Emrooz: “We want all sanctions to be lifted at the same time,” said Iranian Foreign Minister Mohammad Javad Zarif. 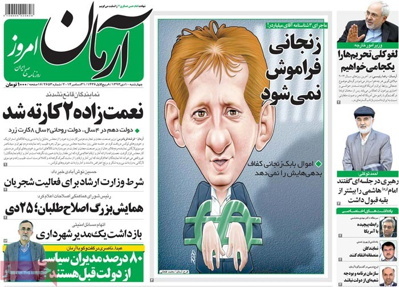 Arman-e Emrooz: The assets of Babak Zanjani [who stands accused of massive corruption] are not enough to pay off his debts. 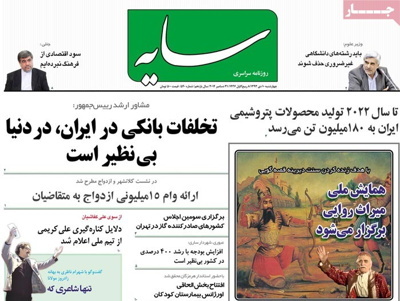 Asrar: Some MPs are collecting signatures to have the minister of education impeached. 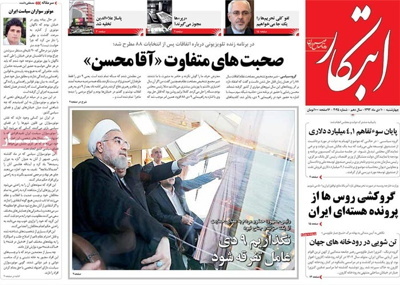 Ebtekar: Alaeddin Shopping Center, a cell phone hub in the capital,has been evacuated after a court ordered its illegally-built seventh floor removed. 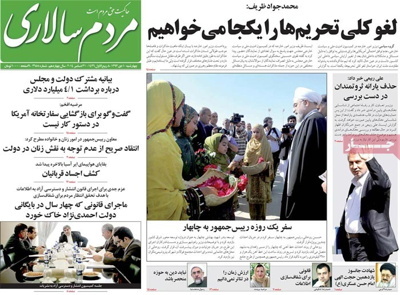 Ebtekar: Russia is using Iran’s case as a bargaining chip. The Russian Foreign Ministry has announced that in case the US imposed new sanctions against Moscow, Russia would prevent the conclusion of a nuclear deal between Iran and P5+1. 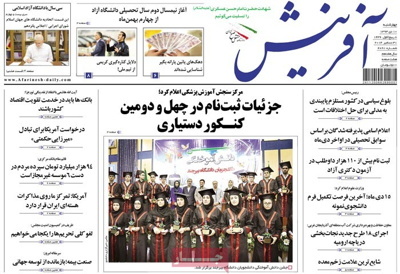 Emtiaz: Samsung Electronics has signaled its readiness to make cell phones and tablet computers in Iran. 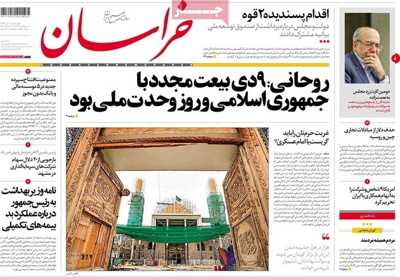 Emtiaz: Iran has extended invitations to German, Swiss and Chinese tourists to visit the country. 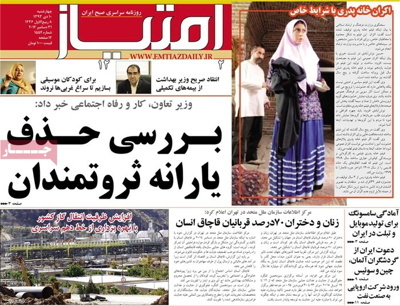 Etemad: The Inspectorate General has ordered a halt to all tourism development efforts on the Caspian island of Ashuradeh. 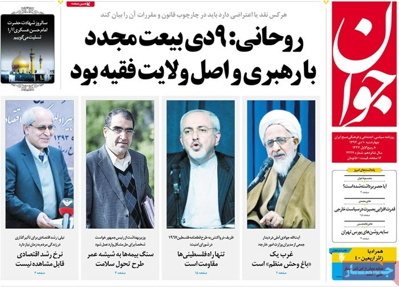 Etemad: The decisions made by the Ahmadinejad government [the green-light to imports of rice and luxury cars] have led MPs to issue a second yellow card to President Rouhani’s trade and industry chief. Ettela’at: Air pollution in Tehran has sent 392 people to hospital emergency rooms. 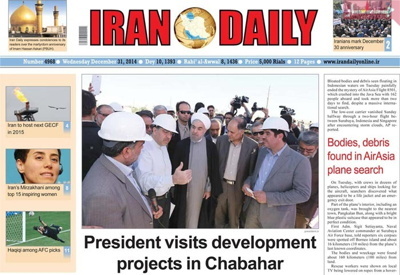 Ettela’at: President Rouhani has inspected development projects underway in the south. Ettela’at: “The needs of those born during the baby boom of the 1980s have yet to be met,” Masoud Nili, an economic advisor to President Rouhani, said. 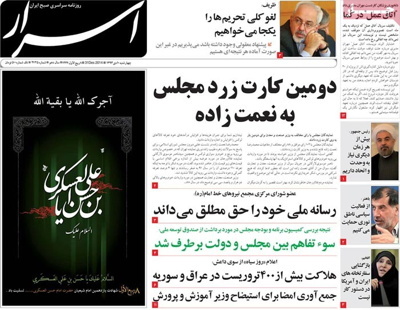 Farhikhtegan: [Principlist MP Ahmad] Tavakoli said no one was as close to Imam Khomeini as [Akbar Hashemi] Rafsanjani. 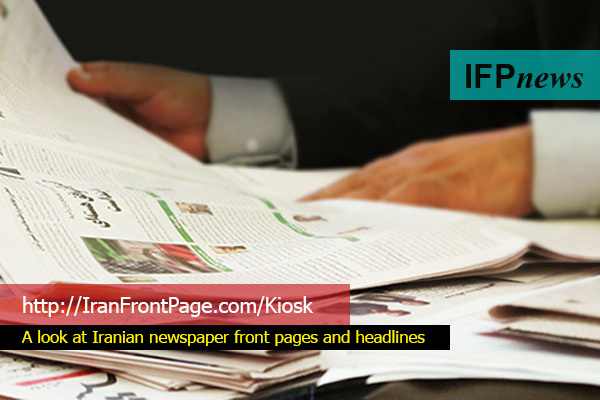 Hemayat: “The killers involved in a deadly armed robbery in central Iran have been identified,” said Police Chief Brigadier General Esmail Ahmadi Moghaddam. Iran Daily: Iran’s Mirzakhani [a professor of mathematics at Stanford University] among top 15 inspiring women. 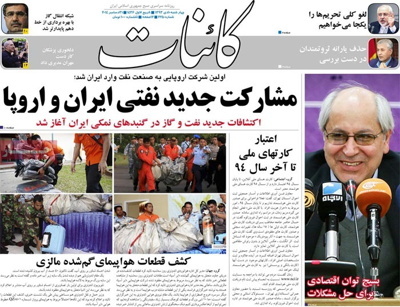 Jamejam: The Central Bank of Iran has warned banks to fully comply with regulations governing interest rates. 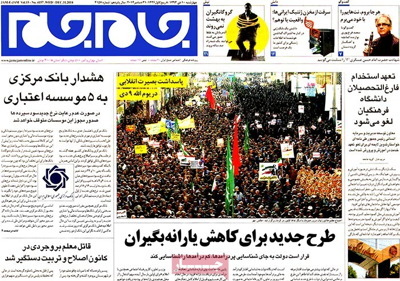 Javan: President Rouhani said the massive turnout of people on December 30, 2009 amounted to renewal of public allegiance to the leader and the rule of the jurisprudent. Jomhouri Islami: “All Iraqi territory will soon be purged of terrorists,” said the secretary of Iran’s Supreme National Security Council. Jomhouri Islami: “The reopening of embassies is not on the agenda of talks between Iran and the US,” said Iranian Foreign Ministry Spokeswomen Marzieh Afkham. Kaenat: Inauguration of a tenth national gas line has shored up the country’s national gas supply. 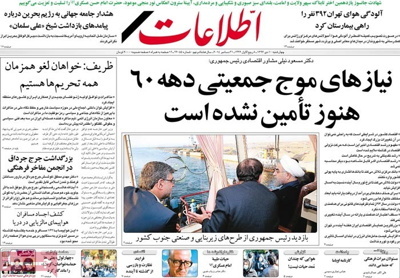 Kaenat: New oil cooperation between Iran and Europe. A fresh round of oil and gas explorations has started in Iran. 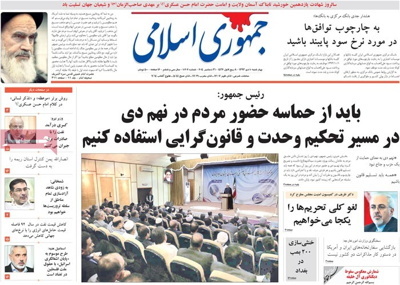 Khorasan: The Iranian health minister has written a letter to the president complaining about the performance of companies that offer complimentary insurance to the public. Mardomsalari: The minister of labor and social welfare has said that a plan to cut the cash subsidies of the rich is under study. 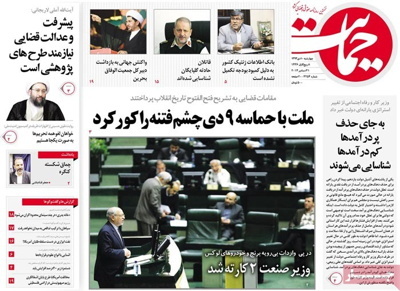 Resalat: A poll conducted by the Center for Public Opinion Studies shows that Iranians are distrustful of P5+1. Sayeh: Tehran is to play host to a third meeting of the natural-gas exporting countries. Sayeh: A national gathering on the “Heritage of Storytelling” is to be held.